By Mack W. Borgen. Author, Dead Serious and Lighthearted – The Memorable Words of Modern America (Vols I, II, and III) (2018 and 2019) and The Relevance of Reason – The Hard Facts and Real Data about the State of Current America (Vols I and II) (2013). 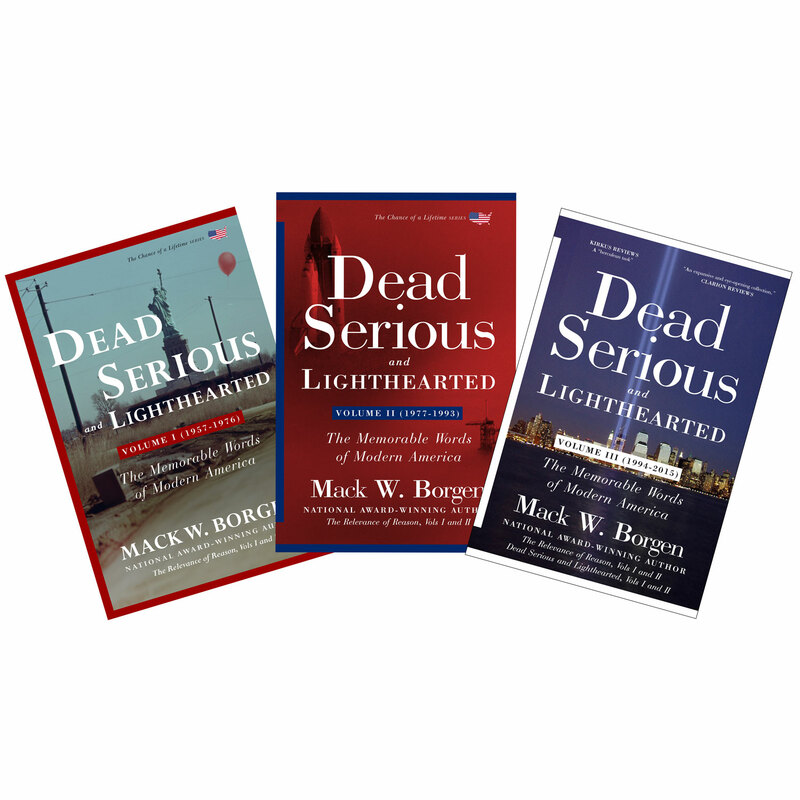 See New Book Specials at Book Ordering Tab. Order your books today!! Copyright 2018. All right reserved. No part of this article may be reproduced or transmitted in any form or by any means, electronic or otherwise except in the case of brief quotations and reviews, without the prior written consent of the author. Every community has its special places. Some are nationally famous — Chicago’s Miracle Mile; San Francisco’s North Beach, Union Square, and Fisherman’s Wharf; New York’s Times Square, TriBeCa and Soho; San Antonio’s Riverwalk; Portland’s Pearl District; Seattle’s Pioneer Square and Pike Street Market; Los Angeles’ Rodeo Drive and Venice Beach; New Orleans’ Bourbon Street; San Diego’s Gaslamp Quarter, and on and on. In a parallel manner and based upon varying blends of history, architecture, shopping, and commerce, even smaller cities like Santa Barbara, California have their own special places and city centers. They have their “old towns,” their landmarks; their historic districts; their city parks; and their defining shopping districts and neighborhoods. These special places are usually “central” to not only the economic well-being of the city but also the community life and spirit of the city. These special places help define the town and are understandably viewed as community assets even though they are oftentimes, if not almost normally, composed of both private property and public lands. The ideas and recommendations contained in this article could theoretically apply to many cities and towns and shopping centers and districts in America. However, every town and every circumstance is, to a degree, unique. The specific issues relating to every parcel of land, every stretch of highway, and every downtown are best specifically addressed by those persons who know the area well. 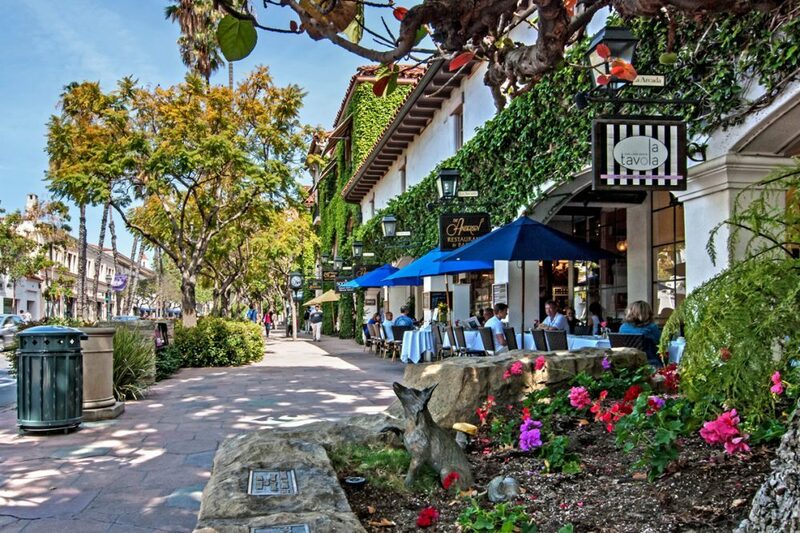 Thus, this article is intended to focus upon Santa Barbara, California — and, more precisely, SB’s Downtown State Street. Santa Barbara is blessed with many landmarks – the Mission, the Beaches, the Zoo, the wonderful neighborhoods, the many parks, and nearby Montecito and UCSB. But this article focuses upon the 1.6 miles of SB’s Downtown State Street. The reason for this focus is because Downtown State Street is the main tourist and shopping and dining and drinking and strolling and people-watching “center” of our city. Fourteen great blocks of unique shopping, great food, and distinctive architecture — anchored by the Arlington and Granada Theaters at one end and Stearns Wharf on the other end with the wonderful La Arcada and El Paseo Mall in the middle. Downtown State Street is complete with electric-shuttle bus service, and the area is designed with wide sidewalks and numerous sitting benches. Beautifully and carefully planned, Downtown State Street is supported by nine parking lots and five parking structures nearby with a combined more than 3,000 parking stalls. Downtown State Street is the “center” of our city. But now, like downtowns all across America, Santa Barbara’s Downtown State Street is in trouble. Its retail stores continue to struggle or, worse yet, have closed. Once decorated windows have been replaced with the cold stare of plywood. Unsurprisingly Downtown State Street’s very vitality is challenged. Downtown State Street, and Santa Barbara with it, is in trouble. As noted above, the analysis contained in this article may also be applicable to many downtowns and arguably many shopping centers as they also try to adjust to our country’s new shopping patterns and to the onslaughting impact Internet shopping and, more particularly, the rise and omnipresence of Amazon. On a more minor and lighter note, the word “onslaughting” doesn’t exist. But it should. In 2002, just 16 years ago, online commerce represented only $42BB of U.S. commerce. By 2010, that number had more than tripled to $142BB. By 2017, it had more than doubled again to $336BB. In the last 15 years, online commerce has grown eight-fold, and there is neither reason nor expectation that this trend will change. Unlike Sears, Brookstone, NineWest, Claire’s, The Walking Company, Kiko, A’Gaci, Wet Seal, Toys “R” Us, Rue21, Radio Shack, BCBG, Sports Authority, Frederick’s of Hollywood, Cache, and a couple thousand more stores, online “stores” never close, and online commerce is here to stay. And to grow. The most direct competitor to online shopping remains the bricks-and-mortar stores which comprise most of America’s historic downtowns – although to SB’s great credit and distinction, many of Downtown State Street retail stores were not chain stores. But it needs to be remembered that it is not merely retail commerce which is at stake. Downtown State Street is historically where much of our community gathered for dining and drinking and coffee and strolling. Those “community activities” can be destroyed by empty shops and the ugly aura of abandonment. This downturning has been accelerating for the last several years, and many good and honorable ideas have been proposed to increase the economic vitality of Downtown State Street. Some of these ideas seek to directly counter the wave of retail vacancies, but most do so only indirectly — by seeking to enhance Downtown State Street by addressing infrastructure problems, by minimizing nuisance behavior and addressing public safety issues, by improving transportation and parking, and by generating larger crowds through, for example, the sponsorship or facilitation of more downtown shopping, arts and cultural events. The Downtown State Street problems also have triggered many good and honorable land use planning and permitting ideas. And as is always the case, some of the debates have essentially been prioritization debates. Some people argue for an immediate focus upon the implementation of short-term solutions. Others have encouraged the community to focus upon longer-term solutions. Thus, in sum and regardless of one’s project preferences or desired prioritization of efforts, there now have been meetings, hearings, conferences, studies, reports, commissions, and the usual hover-gathering of consultants. The State Street Task Force was formed, and more commendable ideas have surfaced. 18 – Installing more public art and improving the Highway 101 Underpass. But, so far, nothing is really changing. We all know that. And we cannot stand by and hone our pouting. The need to target property owners is so many of the key problems relating to Downtown State Street are the result of the growing number of retail space vacancies. The property owners alone have the sole and real power to fill vacancies. Theoretically, property owners can define the terms of the lease — the rent, the term, the property usage, the annual escalation, percentage terms etc. But property owners cannot be allowed to exercise that discretion in isolation from the valid needs and reasonable expectations of our community. The time has come for more aggressive incentives to get these properties leased — both the retail and the commercial properties in Downtown Santa Barbara. This author has been a real estate attorney for decades. That is certainly neither a good thing or a bad thing — but from that perspective, this author can attest that properties can assuredly be leased if that is the serious objective of the property owners. Alternatively, waiting for the market to shift or rental rates to increase may be a myopic, even delusional, plan. More importantly, such waiting should be viewed as unacceptable both for the preservation of Downtown State Street and from the perspective of our community. As with many downtown retail store closure and the attendant area deterioration issues, circular chicken-or-egg debates can continue endlessly about whether the area’s problems caused the vacancies or whether the vacancies caused the area’s problems. But the entwining inter-relationship between the downtown problems and the downtown vacancies is obvious. Many of the fine ideas listed ideas should be implemented for a multitude of reasons, but nothing will get seriously better until the number of downtown vacancies declines. And, to date, that has has been allowed to lie (in a sense, too much) within the power and the prerogative of property owners. Stores have to be open. Lights have to be on. Restaurants have to be serving meals. Coffee houses have to be pouring their coffee and bars have to pouring their drinks. There has to be a sense of crowd and community and a plethora of reasons to be there – you know, to be downtown. The sad, but stubborn, truth is that small steps are not going to suffice. New trash cans and more downtown events are not going to generate the needed impact. They will not deliver the vitality for our downtown. That can only be done by more stores; by increased storefront occupancies; and by more shopping and dining. A carefully designed – but more aggressive and targeted – approach is necessary. So far, this article has referenced Downtown State Street as a “community center” and a “community asset.” And there is no doubt that it is in Santa Barbara’s “community interest” to rejuvenate our downtown. However, it is also time to be more blunt – not to offend, but to motivate. In the end, property taxes aside, it is the property owners who or which take home the profits. [v] It is the property owners — acting through their LLCs, partnerships, corporations, trusts, or leasing agents or property managers – who directly and rightfully benefit from the receipt of rental payments from occupied retail and commercial spaces. It is arguably wonderful, albeit to some curious, that property owners can so well, begrudgingly or otherwise, tolerate such vacancies presumably in the hope that the rental market will return or while they patiently formulate new long-term alternative plans for their properties. In other words, it is good that Downtown Santa Barbara’s property owners have the means and the time to wait. But we do not. Santa Barbara cannot wait, and Santa Barbara should not have to so wait because it is necessary for Santa Barbara to finally (and more firmly) recognize that the property owners are the real keys to resolving the glut of Downtown State Street store vacancies. And property owners should find some cold comfort in the uniqueness of the Santa Barbara market. There are some communities where there is no rental market. No lowering of rental rates will attract prospective tenants. There are some downtowns that have long turned to dust. There are some communities (such as in some of the smaller western towns in which I have lived) that have had their downtowns permanently Walmarted — and those downtowns are not coming back. There are some downtowns (such as in many of the Rust Belt or factory towns of the Midwest and Northeast) that cannot generate downtown vibrancy because the city’s population base has long since moved — and those downtowns are not coming back. But that is not the case in Santa Barbara. In Santa Barbara, the customers are here, but the stores are not. In Santa Barbara, the restaurant patrons are here, but the restaurants are not. In Santa Barbara, the tourists are still coming, but there is less to see. There are fewer places for them to spend their time and spread their wealth. In Santa Barbara, the tenants are here, but the rental rates are not. Thus, while again commending the many fine “Save Downtown State Street” ideas which have been presented and which are listed above, it is time to more narrowly focus. It is time to have the property owners better and further incentivized to get their properties leased. And, thus, this article proposes what is colloquially known as a vacancy tax, fee. or charge. Since this charge is not truly a tax[vi] (partly because it is wholly voidable at the election of the property owner), it is referred to in this article as the Contingent Vacancy Charge (“CVC”). The CVC here proposed is very carefully and very narrowly designed. Because any proposal for additional charge, no matter how denominated (tax, fee or charge), can trigger instinctive objections by some persons, the following preliminary considerations are offered in support of the adoption and use of such CVC. First, the CVC would not be not punitive, and it would be entirely voidable. It is merely a means of better incentivizing property owners but it admittedly (and intentionally) would financially punish those property owners which allow their properties to languish; to remain empty for long periods of time. The rough concept is that if, for whatever reason, a property owner elects not to lease its property for a sustained period (and thereby failing to contribute to the vibrancy of the Downtown State Street area), then such property owner should be obligated to remit escalating CVC payments to the City of Santa Barbara. Upon receipt of these payments, the City can use such monies in order to fund the many other programs and ideas necessary to preserve, protect, and enhance Downtown Santa Barbara for the benefit of such property owners and for the City of Santa Barbara. This proposal is respectfully mindful of the Six Truths which are – or at least should be — associated with this proposal. Truth One: “Four-Letter Word.” Even a CVC will be seen by some as a tax or a fee, and despite the three-letter spellings of both “tax” and “fee” – they are still four-letter words. Truth Two: “Easier to Make Less Than Pay Anything.” Although wholly illogical, property owners (admittedly like many of us) find it weirdly easier to make less than to pay anything. Truth Three: Other People’s Money Issues. The CVC proposal is unavoidably an OPM (Other People’s Money) resolution, but it is the best, most effective, and possibly only way to rejuvenate SB’s Downtown State Street. since they, too, are almost definitionally true. Truth Four: Downtown State Street Should Be Viewed As What It Is —–—- A Grouping of Publicly- and Privately-Owned Properties Which Collectively Comprise a Valuable Community Asset. Despite the private ownership of most of the buildings and retail space on Downtown State Street, the area should be recognized as a community asset. Although the property owners receive and rightfully retain nearly all of the rental (and sometimes sales) proceeds flowing from their commercial retail, and storefront properties, our community has the right to care about Downtown State Street and to take steps to protect and preserve our Downtown State Street as a unique community asset. Stated conversely, property owners in and around Downtown State Street[vii] have a limited, but dutiful, public responsibility to community to keep their buildings and retail storefronts occupied. It is good, and it is in SB’s own self-interest that Downtown State Street is blessed with wide sidewalks, electric shuttles, and ample parking – but this is a (no pun intended) two-way street. It IS the obligation of property owners to keep their buildings both occupied and in good repair. This author is well aware of the probable responsive don’t-tread-on-me clamors which a CVC proposal will generate. However, the frontier closed more than 100 years ago. Cities in fulfilling their public mandates rightfully and routinely exercise certain powers over the use of private property in many ways – from zoning to building codes; from parking ratios to architectural and design restrictions; and on and on. Properly drafted, this is no different. The adoption of a CVC ordinance is also closely analogous to the myriad of effectively similar provisions which are common to all major shopping center leases wherein landlords routinely not only require occupancy but also imposes open-for-business, stores hour requirements and even product definitions (and limitations) and signage mandates. Whether it be homeowners association’s CC&Rs, shopping center master leases, or zoning ordinances or building codes, private property – and especially urban, private property, is rarely owned “free and clear” of the city or town in which it is located. Truth Five – Commercial and Retail Vacancies Have To Be Eliminated or Minimized – For Benefit of Both Property Owners and Community. Despite the many good Downtown State Street ideas which have been developed over the last several years and which are noted above, Downtown State Street cannot become revitalized until the number of commercial and retail vacancies is drastically eliminated or minimized. For this reason alone, property owners should have taken the lead. Since they have not, city should adopt a CVC ordinance. Truth Six – In Santa Barbara There Remains a Direct Correlation between Rental Rates and Occupancy Levels. There is a direct correlation between rental rates and occupancy, and at least for the foreseeable future, the rental rates must be adjusted, i.e. lowered, in light of the market impacts of, especially, Internet-shopping. Legal challenges aside, it is not here proposed that the city seek to mandate any leasing or to set any rental rates. However, if a property owner elects to keep his rental rates above the true market rate and if the subject property remains vacant after a designated period, then the building owner should be required to remit to and for the benefit of SB a charge. As noted above, sometimes even lowering of rental rates will not generate tenancies. However, that is not the case in SB. But for the currently demanded, high rental rates for Downtown State Street retail and commercial spaces, many SB stores and businesses would welcome the opportunity to relocate to Downtown State Street. In this sense, Downtown State Street remains distinguishable from other languishing downtown areas that have been, as noted above, been Walmarted and box-stored out of meaningful existence and similarly from distressed residential communities. Thus, the stubborn (and good) reality is that many retail stores and other commercial tenants would readily relocate to Downtown State Street – except for the rent rates still demanded by Landlords. The CVC, if high enough, will motivate some property owners to lease their properties or will impose upon them a charge payable to the community for its use in enhancing Downtown State Street. It should be noted – and may be comforting to some – that the concept of a CVC is not entirely unique. Variants of CVC ordinances have been adopted in many domestic and even foreign[viii] jurisdictions. Some of them can be traced to a community desire to enhance, if not try to ensure, the commercial vibrancy of neighborhoods. In other cases – easily distinguishable from Santa Barbara, CVC-type ordinances have been adopted to impose vacancy-based charges upon property owners in the hopes of minimizing the number and impact of “ghost buildings” or the rows of empty and abandoned residential homes. In these instances, vacancy charges have been used as a means of deterring landlord abandonment of poor-quality urban housing. In the opinion of this author, it appears that some charges in these other jurisdictions are more in the nature of “taxes.” Unlike the CVC proposed in this article, these jurisdictions seem to impose a far less targeted, vacancy-based tax, and certainly some of these “taxes” are rooted in revenue-raising motivations. For example, a jurisdiction-wide and more complicated approach is used in Washington, DC where a higher tax rate is imposed on vacant property (5% of assessed value) and blighted property (10% of assessed value) as compared with occupied property tax rates which vary from 0.85% to 1.85% depending on use. Somewhat similarly, San Francisco imposes a small $771 per property annual fee upon owners of vacant properties, but it relies upon self-reporting, and it is widely acknowledged that this fee is rarely paid. Only New York seems to be considering the use of a vacancy charge in response to vacancies in retail districts such as SB’s Downtown State Street. This more closely analogous case has occurred in certain areas of New York where there are a number of retail corridors “struggling with double-digit rates, from 27 percent … (in parts of) the Upper West Side to 20 percent on a stretch of Broadway in Soho.”[ix] Angering both city officials and area residents many of “these overpriced, beautiful properties” have remained empty for years solely because many property owners (possibly like Santa Barbara) prefer to wait for area rents to increase before committing their real estate to long-term leases with relatively fixed rates. But, also just as in the case of Downtown State Street, these “abandoned storefronts are an eyesore,” and collectively they are impacting wholly communities. Thus, the reason being given to the imposition of vacancy-based charges in New York is, once again, the same as it is in SB. In effect, property owners cannot be allowed to decimate city “assets” merely because they can, for whatever reason, “afford” to wait for market rental rates to increase. The structuring of the CVC must be carefully designed – especially since the objective of the CVC is not revenue generation. Instead, it is to eliminate, or at least, minimize long-period retail vacancies in Downtown State Street. Thus, the drafting of an effective and fair CVC ordinance should be viewed from two perspectives. It can be viewed as motivational and incentivizing in that it will hopefully encourage property owners to take steps (including, if and as necessary, the lowering of their rental rates) to avoid long-term vacancies in their properties. Alternatively, it can be viewed as punitive in that it does, admittedly — but only after the property owners are given ample time to re-lease their subject space – impose an escalating charge payable by the property owners with respect to their vacant space. The CVC should not be drafted as a complicated ordinance. It should not become buried with regulations, wrapped in nuance, and tied down by litigation. Instead, the CVC is suggested as a direct charge which can be easily understood and easily communicated to property owners. In the case of a Downtown State Street CVC ordinance, it is recommended that the following provisions be included for, alternatively, the property owners or the City. Advance Notice of Implementation. The CVC, even though voidable, would be a potential new charge imposable upon property owners. Therefore and because it is new, property owners should be given reasonably sufficient time to lease their properties before the imposition of any CVC. Reasonable Allowance of Time for Landlords to Market and Lease Properties. Despite the recommendation for the adoption of a CVC, it is recognized that leasing, and especially commercial and retail leasing, can be a lengthy process. Properties must be vacated by prior tenants. Thereafter, properties must be inspected. Leasing and marketing plans must be made. Brokers must be retained. Prospective tenants must be identified and evaluated, and the proposed property usage(s) must be carefully considered. The author of this article is an experienced commercial leasing attorney, and – as such – it is readily acknowledged that rental rates, usage definitions, and many other leasing terms can be complicated and the subject of protracted negotiations. Even upon agreement of the primary lease terms, the lease itself must be negotiated, finalized, and executed. Furthermore, it is not uncommon for there to be ancillary transactions and documents which are necessary relating to, for example, the incorporation or limited liability company formation of a tenant entity or the negotiation and preparation of lease guarantees. Lastly, in most cases, there are property adaptations and tenant improvements to be planned, permits to be obtained, and certificates of occupancy to be issued. All of these matters take time, and this period is herein referred to as the “Leasing and Improvements Period.” Under any adopted CVC ordinance, property owners should be allowed a reasonable Leasing and Improvements Period prior to the triggering imposition of any CVC. Contrariwise, if for any reason, the subject property has not been leased and is not occupied and open to the public within such Leasing and Improvements Period, then the property owner should start remitting a vacancy tax for each month, or portion thereof, the property remains unleased, unoccupied, and not open to the public. Streamlining of Permitting Process. Although not a necessary component of a CVC ordinance, it is recommended that the City streamline its permitting process for all commercial and retail spaces within the defined Downtown State Street area and with respect to all proposed property alterations and improvements necessary to be completed prior to the property being issued a certificate of occupancy and open to the public. No Diversion of CVC Fee Revenues. Even though the long-term objective of the CVC ordinance would be to collect zero dollars, to the extent CVC revenues are collected, these revenues should remain isolated and earmarked solely for usage in supporting Downtown State Street rejuvenation. CVC revenues should not be allowed to be viewed at any time by the public or by its elected officials as another general revenue source. Tight Definitions of “Vacancy” and “Occupancy.” The definition of “vacancy” is critical. A store can and in some cases should be deemed “vacant” if there is no occupant on-site and if the premises are not open to the public. Thus, even though the space may be under lease, for purposes of any CVC determination, the property should be deemed vacant if it is not being used, is not occupied (with some adjustment for construction and tenant-preparation or tenant- improvements work) and is not open to the public. Without going far afield from the subject of this article, such “open-to-public” definitions are necessary since, without them, property owners could easily avoid the imposition of any vacancy tax by merely having the property under a lease whereby a tenant, even a landlord-affiliated tenant, could execute a ghost lease and assert that the property is “occupied.” Similarly, there must be a tight definition of the term “occupancy.” For purposes of any CVC ordinance, a property should be deemed “occupied” only if, when and so long as the property is routinely and regularly open and available to the public during normal business or retail hours. These types of mandates and provisions would not be unique since, as noted above, these types of open-to-the-public provisions are commonplace in shopping center leases and other master leases. Escalation of CVC Rate. It is strongly recommended that the CVC rate be increased substantially – even quarterly or semi-annually — if the property remains vacant for lengthy period. For example, the base CVC rate may be $X per square foot of rental space per month (or portion thereof) if the property remains vacant for more than Y months. However, the vacancy CVC rate should be increased to $2X per square foot after for example, 12 months, and $3X per square foot after, for example, 18 months. In the opinion of this author, the CVC rate should escalate routinely thereafter (a) so that it becomes more and more costly for the property owner to allow the property to remain vacant, and (b) so that the City will have more monies in a designated Downtown State Street account to be used to preserve and enhance Downtown State Street. It is regrettable that there is a need for this article at all. It is regrettable — but unsurprising — that transitioning from our historic retail and commercial shopping patterns to the newer Internet-based shopping models is difficult. But it is, and the adoption of a Contingent Vacancy Charge ordinance is simple, appropriate and necessary. 1 – Downtown State Street is critical to our community’s economic and social vitality. 2 – Downtown State Street is and should be viewed as a community asset characterized by both public and private ownership. 3 – Many supportive approaches can be taken, but no meaningful change will occur in Downtown State Street until most of the empty commercial and retail spaces are occupied and open for business. 4 – The only effective means to generate Downtown State Street leasing is to directly motivate the property owners via a CVC because the dirty little secret that is well-known to property owners is that in SB there are interested and qualified tenants who would readily relocate to Downtown State Street as soon as the market rates are meaningfully lowered. 5 – A carefully designed (and punitively escalating) CVC will either (a) motivate some property owners to lease their respective commercial and retail spaces or (b) provide ready funds for use by civic authorities to continue to enhance and preserve Downtown State Street. This proposal is no different. This proposal for a commercial vacancy charge imposable by the City of Santa Barbara upon inadequately market-aggressive property owners is no exception. In other words, “I could be wrong, but” — for the many reasons set forth in this article I believe a CVC is worth considering – both seriously and now. [i] For several good summaries of the recent downturning of State Street see, for example, Noozhawk, October 26, 2018. [ii] Noozhawk citing Hayes Commercial Real Estate). [iii] For a fuller presentation and explanation of many of these ideas and items, see the fine reporting by Ms. Giana Magnoli, Noozhawk Managing Editor. [iv] Examples of ideas which focus (entirely or at least in part) upon filling retail storefront vacancies are the hiring economic development consultant; the possible formation of Economic Development Department; the retention of a retail recruiter; and the changing of planning codes to streamline the permit process for downtown commercial space. [v] The word “which” is used rather than “who” because, for a multitude of reasons, most commercial properties are held in trusts or by entities such as corporations, limited liability companies, or partnerships. [vi] While it is beyond the scope of this article, it should be noted that some commentators may suggest that any form of vacancy-based charge, whether called a tax, fee, or charge, would be impermissible in California because under California’s Proposition 13, taxes based upon value of a property cannot exceed 1% of assessed value, without voter approval. However, this author would strongly suggest that the CVC here proposed is easily distinguishable from a Prop 13 tax. First, like building permit and a multitude of other city-imposed fees and charges, it is triggered by the landlord’s behavior. For example, the CVC here proposed is wholly avoidable by the landlord’s leasing of the Property. In fact, the entire basis and objective of the CVC is to not have to impose CVC revenues. Secondly, this is a special area tax which, at least as here proposed, would apply only for the unique circumstances and to the limited and defined area of the Downtown State Street corridor. [vii] The phrase “Downtown State Street” is used throughout this article, however a more precise phrasing for the application of the CVC may be the “Downtown State Street Corridor” since the Downtown State Street areas may be appropriately and more wisely defined to include, for example, three streets (i.e. Anacapa Street, State Street, and Chapala Street together with the included portions of the intersecting streets). [viii] See, e.g. similar taxes which exist in France, Australia, and in some parts of the UK. In addition, Vancouver, BC imposes an “empty homes tax” equal to 1% of the assessed value of non-primary homes and rental units which have remained unoccupied for at least six months a year. [ix] Calder, R.; Rosner, E.; and Brown, R., nypost.com (March 30, 2018). [x] Editorial Board, nytimes.com, November 19, 2017. This entry was posted on Tuesday, November 27th, 2018 at 10:59 am	and is filed under Latest News. You can follow any responses to this entry through the RSS 2.0 feed. You can leave a response, or trackback from your own site.